If you’re here just to find out what is the best RV mattress on the market and don’t have the inclination to go through hours of research, the following paragraph should tell you everything you want to know. After consulting the best RV mattress reviews, both from specialist bloggers and satisfied customers, we’ve concluded that the product most likely to satisfy your needs is the Dynasty 10GEL-QUEEN-RV. Any camper will appreciate how well this product dissipates heat, thanks to the innovative dual airflow layers found underneath a medium-hard memory foam top. It’s also covered in a fire barrier for extra safety and can be purchased in a wide variety of sizes, including dedicated ones for RVs. If the Dynasty 10GEL isn’t available, you can try out the Zinus SM-SC-BTCM-8SQ, which offers great comfort and size for an RV mattress. 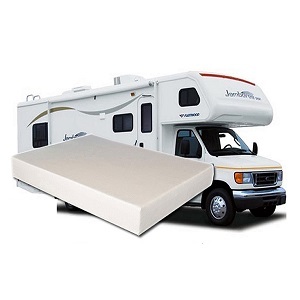 Provided the unusual medium in which is required to function, an RV mattress must satisfy a special set of requirement. Of course, comfort is always paramount, but resistance to environmental factors and size are just as important when traveling in an often small and poorly insulated trailer. Here are some things to look for when purchasing one. Whether you are using it as a permanent residence or just a mobile vacation house, it’s important for the trailer to feel as much as a regular home as possible. After all, hours spent visiting places and driving are tiring enough without minor inconveniences to get in the way. When it comes to mattresses, most people agree that memory foam offers the best all around support, with springs coming a close second. Both can generally be found in medium hardness, meaning they won’t give as much as a sofa while still providing a soft surface. 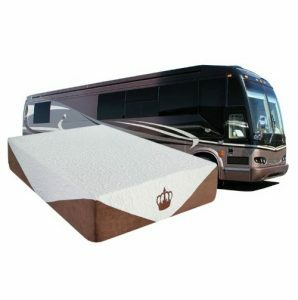 Another important factor for RV mattresses is heat retention. A trailer will never be as well ventilated as a house, so bedding that tends to heat up during the summer can be particularly uncomfortable, especially as the cramped space won’t allow you to move around in search of a cooler spot. This basically translates into resistance to moisture and anything associated with it, such as molds or rust. RV mattresses will be particularly prone to this since you won’t be able to control the climate as easily as in a house. Spring mattresses can easily rust in humid environments making for some very noisy and unhealthy bedding. Foam handles a lot better, and you can prevent it from developing fungi and molds with proper care. Aerated synthetic material is notoriously flammable, however, so it might be a good idea to go for an item with flame retardant covering. If the RV has some serious weight limitations, this might be an important factor. Otherwise, most people prefer lightweight models, since they are easier to install. When it comes to size, it’s very important to look for an RV specific dimension. Beds in an RV tend to be around 5 inches shorter than the equivalent size for a bedroom. For example, a Queen size for an RV will only mean 75 inches in length, as opposed to the standard 80. One of the best-rated RV mattresses on Amazon, the Dynasty 10GEL provides a great degree of comfort through technological innovation. 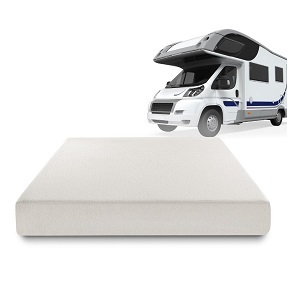 One of the most common complaints with foam mattresses is their tendency to heat up, which can make for particularly unpleasant sleep inside an RV. The Dynasty 10GEL’s innovative design solves this problem by employing a sandwich construction, with two special layers that ensure proper ventilation placed underneath the high-density memory foam top. The upper layer itself features infused gel beads to facilitate airflow and stiffness. Its remarkably cool surface doesn’t come at the expense of other qualities, most reviewers agreeing that it provides the good support expected from any memory foam mattress. As an extra security measure for items of this type, the foam is covered in flame retardant material. While it comes in multiple sizes specifically intended to fit an RV, the Dynasty is not particularly light and might prove a handful to install at 55 pounds. Similar to the Dynasty model, the Zinus Sleep Master combines multiple layers of foam for an optimum degree of comfort. The accent was put on achieving an ideal balance between softness and support, in this case. The top 2 inch of memory foam is meant to conform to the contours of a human body, allowing for good support, while the slightly harder layer underneath prevents the user from sinking in as he would do on a Turkish sofa. The whole structure is complete with an even harder foam base to ensure good stability. This all makes for a pretty tall (8 inches) RV mattress that doesn’t require a flexible base to do its job properly. 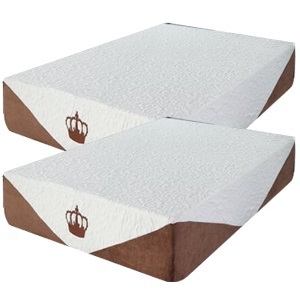 While both affordable and comfortable (many of the Amazon reviewers praise it as the best buy), it suffers from the usual problem of foam mattresses; namely, it can get pretty warm in the summer months. With a depth of 12 inches, this product is guaranteed to offer a nice sleeping surface. It employs two foam layers of different hardness for an overall “medium firm” feel. The upper part is of course made out of high-density memory foam to ensure that your body fits snugly in, and the base is there to provide extra firmness and keep you on an even level. Manufacturers claim a special orthopedic support foam was used, of higher density than what is found in other products on the market. This is intended to offer additional support for people who are particularly susceptible to uneven sleeping surfaces due to medical conditions. It also includes a couple of interesting features, such as a fire resistant cover, and some special provisions to prevent it from retaining heat. Also, the cover can be easily removed to facilitate cleaning.